I could take it no longer, I had to sail. Sarah blew out her ankle again a few weeks ago when we moved aboard, and then, just as she was successfully hobbling around without the crutches on her 32nd birthday, she dislocated her shoulder... again. This time while she was just walking across the parking lot to our boat. By now we know the drill and we managed to put it back in socket in record time. Now, I know it's not all about me, and I am heartbroken to have a wife in an ankle brace and shoulder sling, especially on her birthday, but I can't pretend I wasn't also a bit heartbroken over the loss of a full week promising beautiful weather and ripping wind, just one day after I had finished the navigational light wiring and scraped the prop in preparation for our first sail. For the panel, I just drilled out some starboard and added a bunch of toggle switches, all wired to of one of the 5amp breakers for surge protection. I love the positive feel of those big chrome toggle switches. 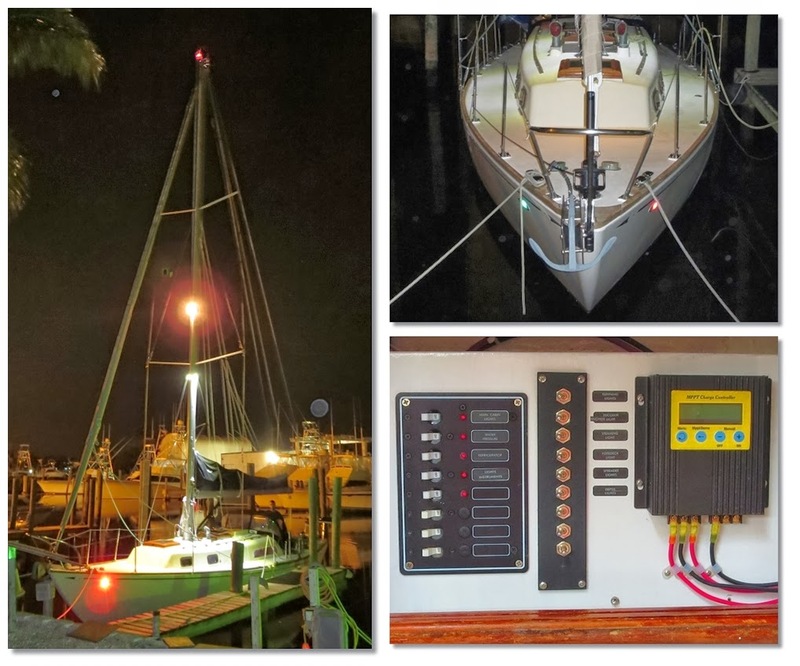 Since all the lights (except the foredeck and steaming lights) are LEDs, even with every light blazing, the 5 amp breaker won't trip. 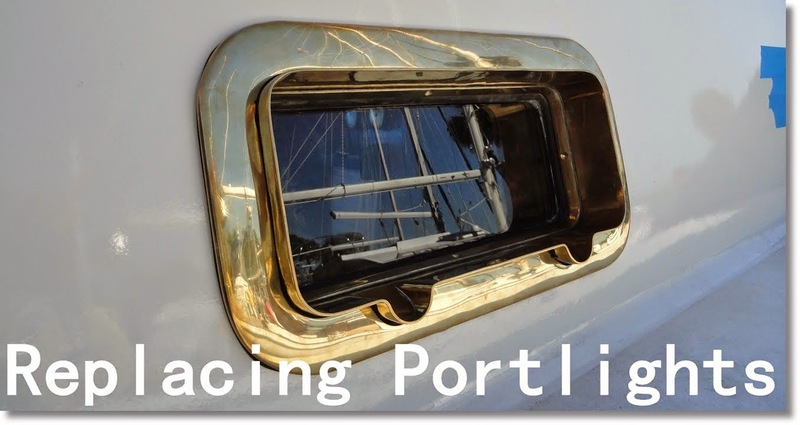 Interestingly, the low power LED spreader lights are significantly brighter than the high power draw halogen foredeck light. Wiring was the easy part. 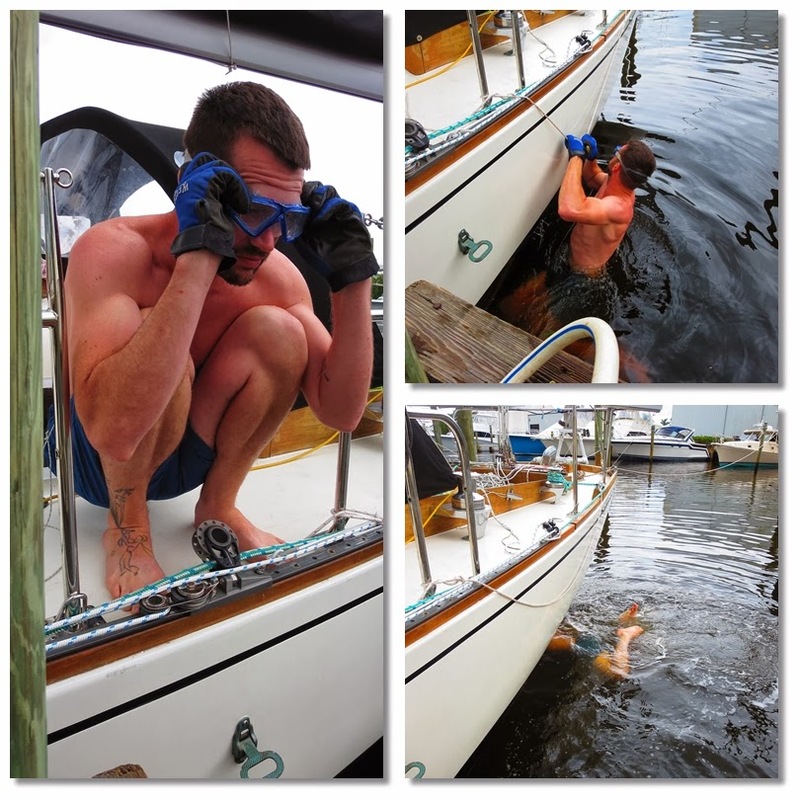 Then I had to dive into the municipal-swimmer-health-warning water to scrape the prop. I dove on the propeller a couple weeks ago to discover it was a mess of barnacles, but was mentally unprepared to do anything about it. This time I was ready. Suited up with some work gloves, goggles, and a prior evening of internal pep-talks, plus a hose at the ready to finish with a triclosan-rich shower, I still managed to hate every minute of it, but at least it all ended with a clean prop and no sinus or ear infections. But no hard work of mine can heal Sarah's wounds. I figured with her new injuries, we were dock-bound for at least another few weeks, but Sarah insisted that we sail (Right? I totally remember that it was Sarah doing the insisting), so we called our friend Clyde, who also lives on a sailboat in Port Salerno. 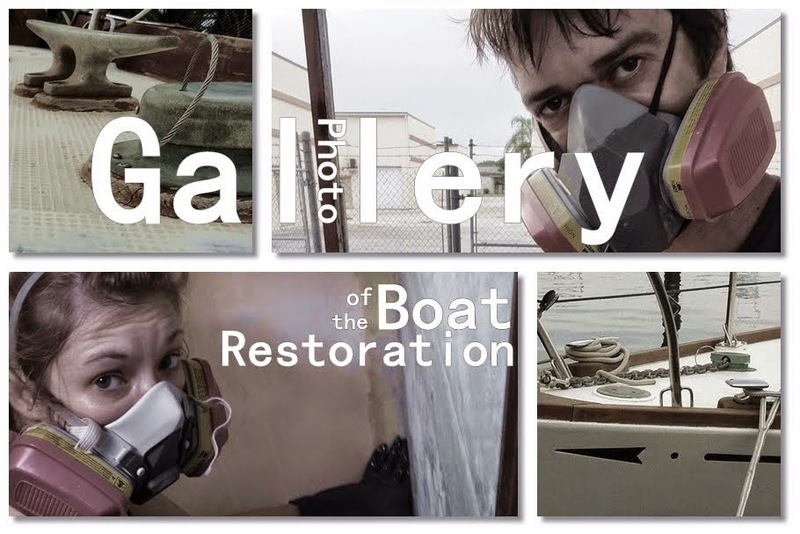 Like us, Clyde isn't so much a sailor as much as a self-declared slave to sanding/painting/fiberglass repair. 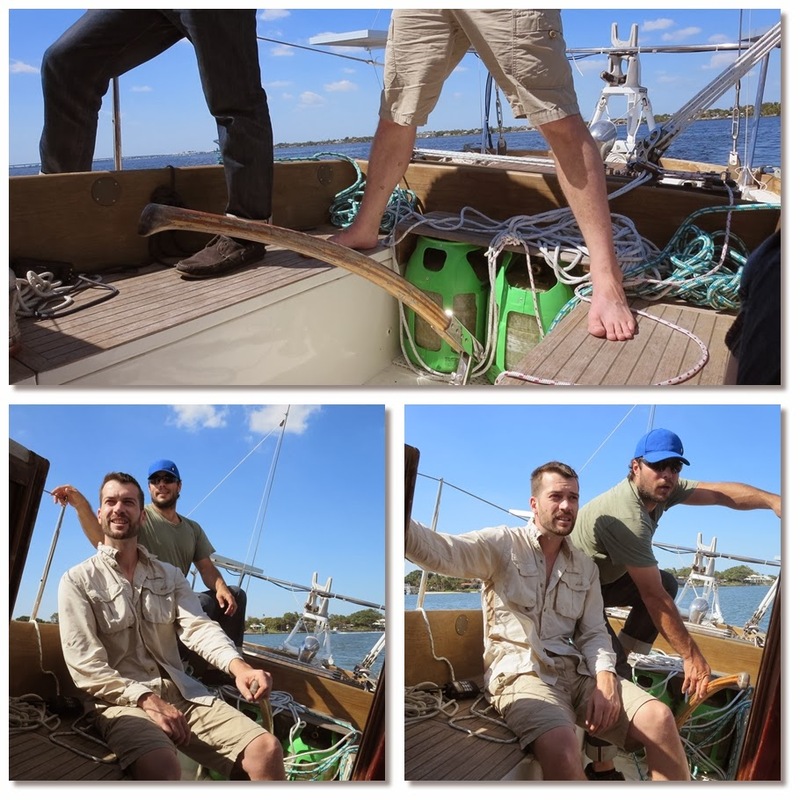 He bought a fiberglass Pearson 31 on the hard in a boatyard in inner Florida, and after 2 years of restoration, he finally launched it and has still been faithfully preparing it to sail over last year while living aboard. He is almost done, just three years later. Sounds like a familiar tale. Clyde jumped at the opportunity to crew with us/me, and we were on the water only a couple days after Sarah's shoulder dislocation. Sarah still performs on the camera with one arm. The lovely motor out to the sailing grounds leads under a fixed bridge. 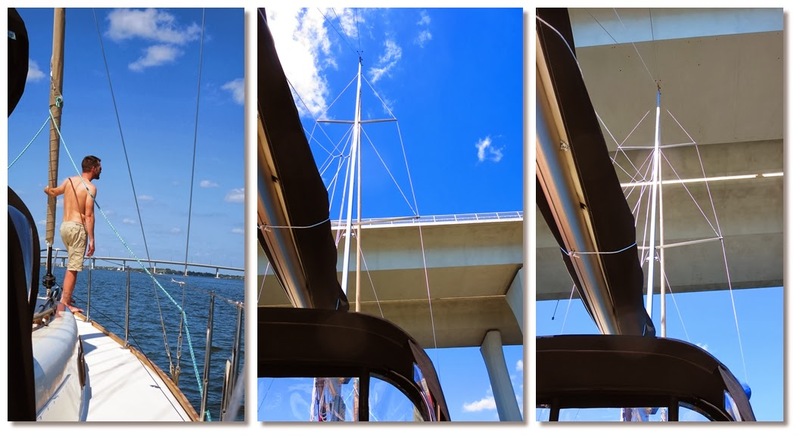 I hadn't checked the height beforehand, but I have gone under it with a Catalina 32 tall rig with no problems, and we have the same masthead height, so I figured no problem. Sure enough, the bridge gauge was at 64 feet, giving us an easy 12 feet of clearance... the problem with vertical perspective still haunts you as it happens though. Finally, after seven years of planning and saving, and four years of hard work, Sarah and I get to spread sail together for the first time in some stiff 20 knot winds. But that didn't phase Robin. 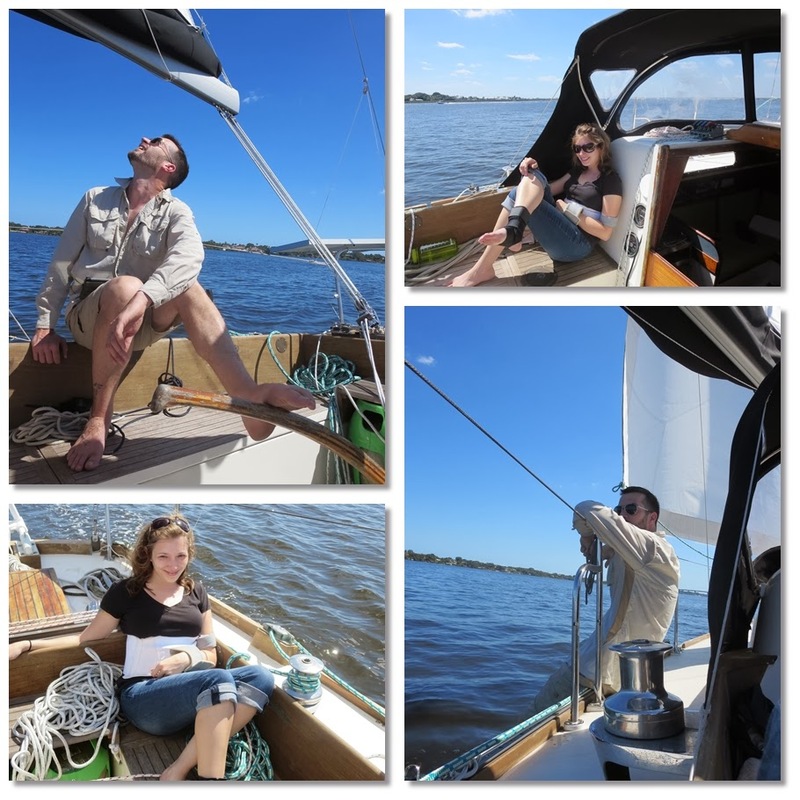 Even under full sail, we were able to maintain an easy motion and acceptable heeling angles. Sarah had no problems enjoying the ride. Now is my opportunity to brag on Robin. 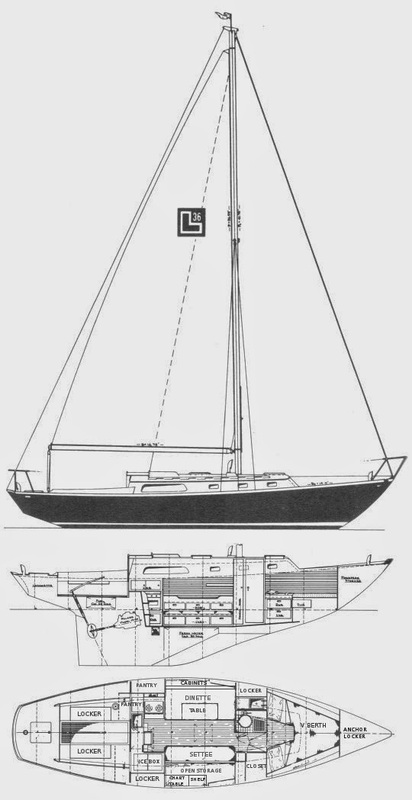 Such a smooth sailing boat with a slow, comfortable motion, and best of all, with a tweak of the mainsail or genoa, you can get the boat to self-steer on almost any point of sail but downwind. At one point we crossed the entire harbor close hauled without touching the tiller. 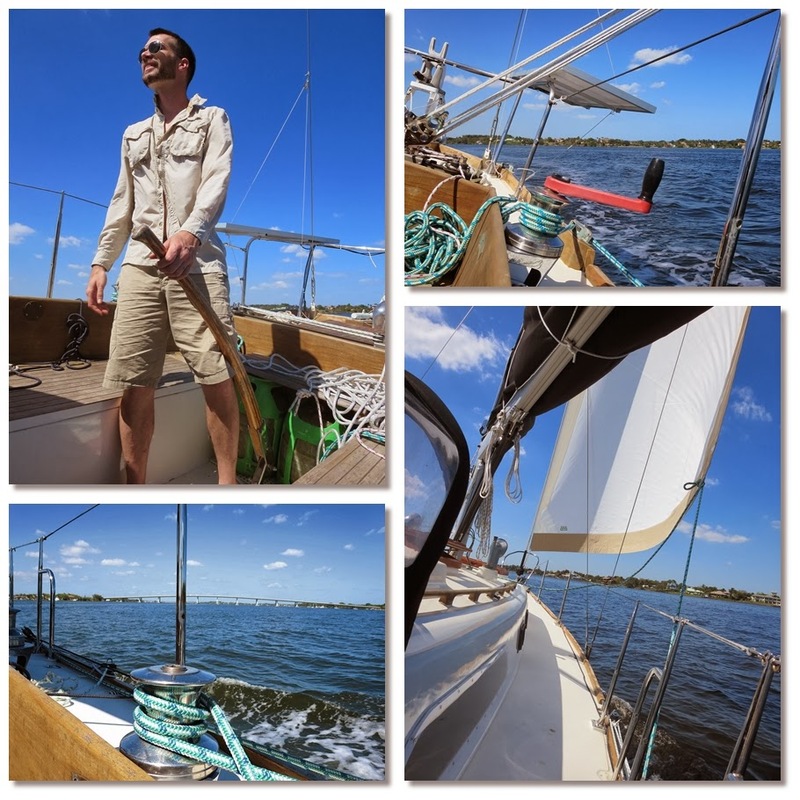 With our confidence in the boat and bridge clearance, we decided to shoot under, pinching hard on the wind with full sail on the way back. Clyde at the helm. 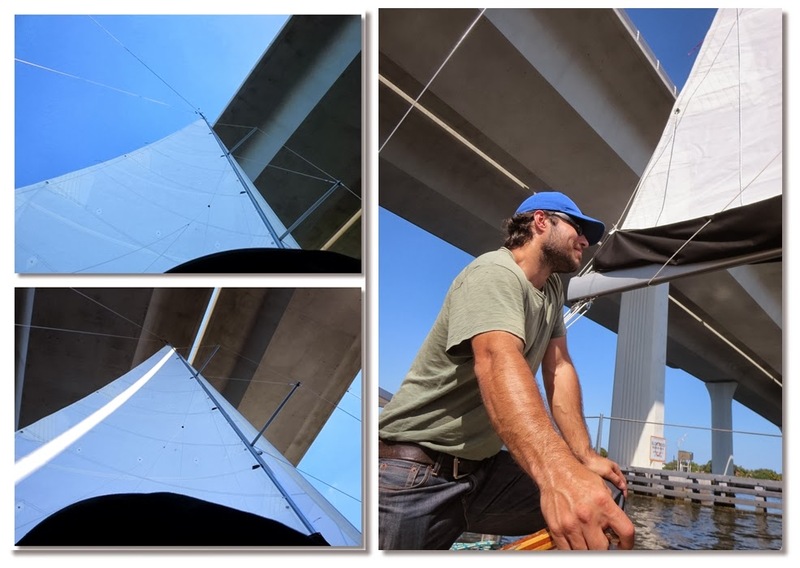 The time lapse between the last series of photos, passing under the bridge, and the sweet contemplation photo of a great day on the water, below, included some classic sailor's excitement. A small pontoon party barge full of curious retirees pulled right up and cornered us between the piers and a rocky point so they could get a look at our pretty sailboat. I say "cornered" because as a sailboat we are wind-direction dependent and at that moment we were flying towards the piers, just past the rocky point, giving us just enough room to round into the wind so I could drop the mainsail. Instead, we had to do a 360 degree tack and gybe with full mainsail in 20 knots of wind, all in an area about 30 meters squared as I was clinging to the mast on the cabin top, waiting to bring the mainsail down when we rounded up again. The exciting roundabout, narrated by a fountain of profanity at the floating cocktail hour, managed to get us a lot more space along with some shocked looks as the party put their cameras away and motored the barge back to the bar. Sarah and I have been dreaming of sailing since we re-met, in fact it is the reason we re-met, and the reason we are together today. We re-met only 7 years ago while I was on leave after I had just returned from my first deployment to Afghanistan. I invited her to come along on a week trip to Europe while I was off to feel out what I remembered of her adventuresome spirit. On the trip I asked her if she was interested in sailing around the world, something I have wanted to do for a long time. She paused to contemplate the vast reality of that question, and answered yes with no reservations. In the ensuing discussion, in that tiny attic studio loft in Amsterdam, we fleshed out our future together. The next day we got tattoos. After we came back to the US, Sarah moved from Arkansas to New York, where I was stationed at the time. The Army sent me to Europe where we solidified our love of travelling (check out the back history on our Flickr). I got out of the Army after another deployment, this time to Iraq, and the rest is history... literally the history captured on this site. But that wasn't how I first met Sarah. Sarah and I met for the first time 15 years ago, then in ballet/jazz class. She was 16 years old and Prima material: petite, graceful, and with impressively strong ability en pointe; I was taking the class for fun because I loved to move and be physical and it was free for men. Sarah was likely headed for a scholarship at a dance school. Unfortunately, she had worsening scoliosis, and at 17 years old she had to have titanium rods and screws installed from the base of her neck to the base of her spine. I was 18, and we were dating at the time. Without a car, I rode my bike 10 miles back and forth to her house every day for months as she recovered. She spent a full month of that summer not moving from the bed, and while I was over I did as much as I could to help out. I had to carefully roll her onto her side to change the bandage that covered the two feet of stitches that were to become the scar down her back. It was painful but exciting helping and watching her learn to walk again as her hips were no longer aligned in the same way anymore and her old muscle memory caused her to trip on her own feet. It took a few months, but eventually she was able to live life mostly like a normal person, albeit with limited flexibility, a lot of pain, and never able to dance again. Time went by, and eventually, as most teenage romances do, we split up. We didn't talk nor see each other for nearly seven years before we re-met and found our lives had wandered down different paths that led us into a similar understanding of how life should be lived. And despite Sarah's current injuries and upcoming shoulder surgery, we are determined. This is how our lives should be lived. We are happier than ever. Great story. I wish you luck. 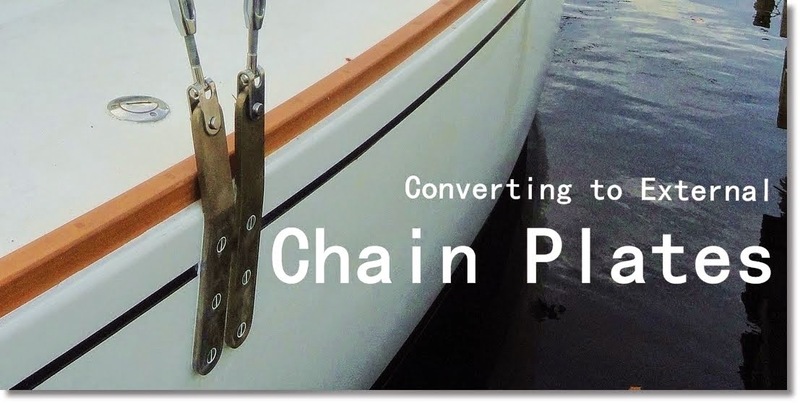 I learn a lot from these great blogs and enjoy hearing about people pulling it together from scratch. One of the more famous blogs revolves around a couple who had everything handed to them! I'll take do it yourselfer's any day of the week. Thanks so much. I've found that no one takes the love and care in repair and maintenance of your things as you will. DIY only comes naturally. Hey guys, I follow your blog and noticed "Port Salerno". 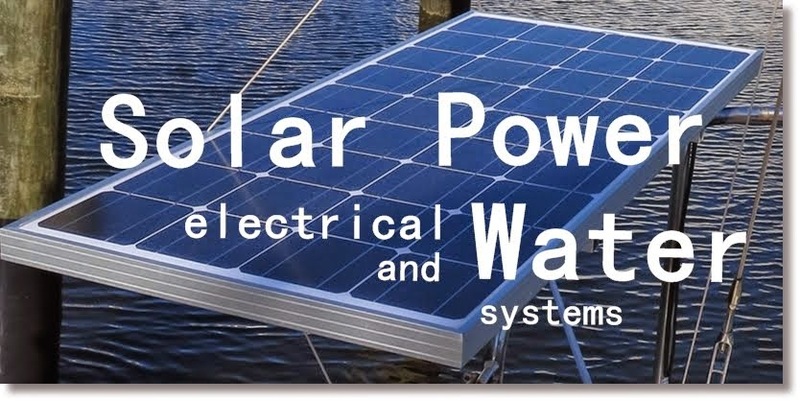 Are you in Martin county. 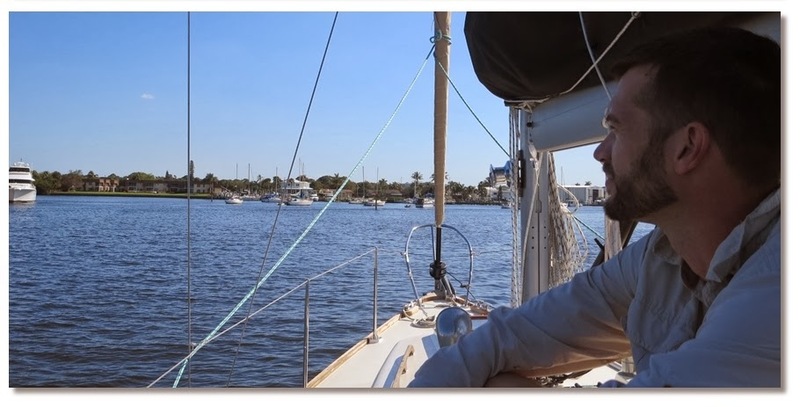 I am in Stuart, Fl refitting a Westsail 32 I just bought. 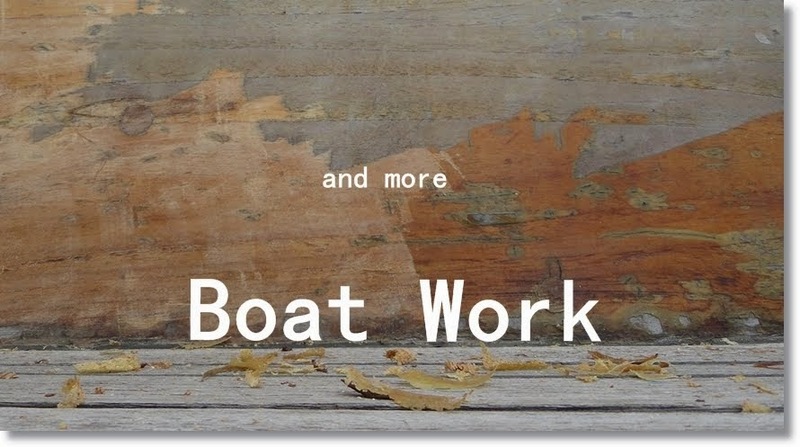 I'm new to refitting a boat and would love some pointers from time to time. My blog is at http://dominamari.blogspot.com/. Give me a shout. We are just wrapping up a similar refit (Novice to not-so-novice). 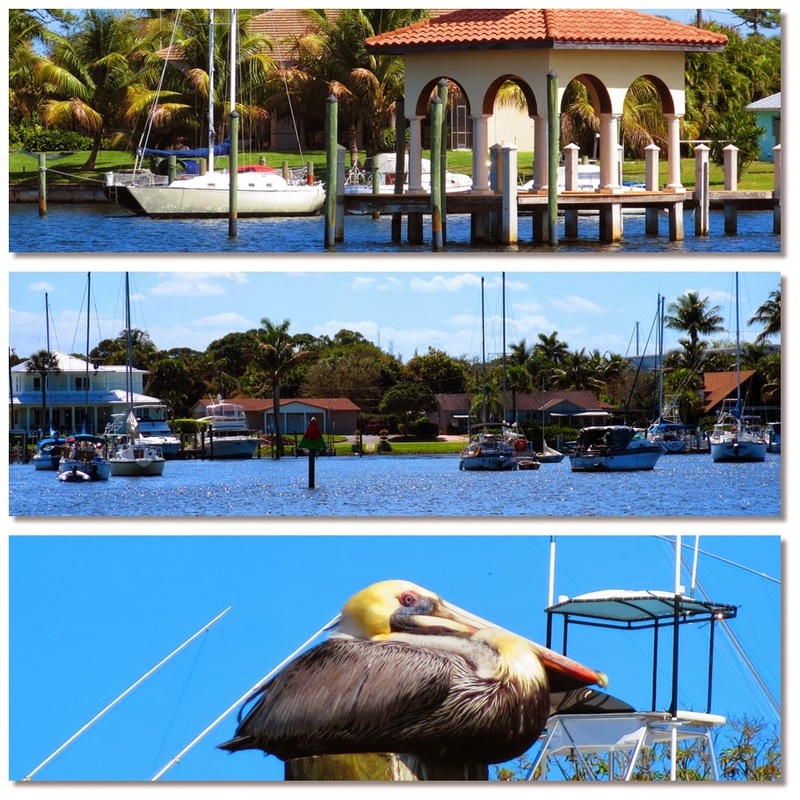 We started in Stuart, at Sunset Bay where the boat was moored when we bought it. 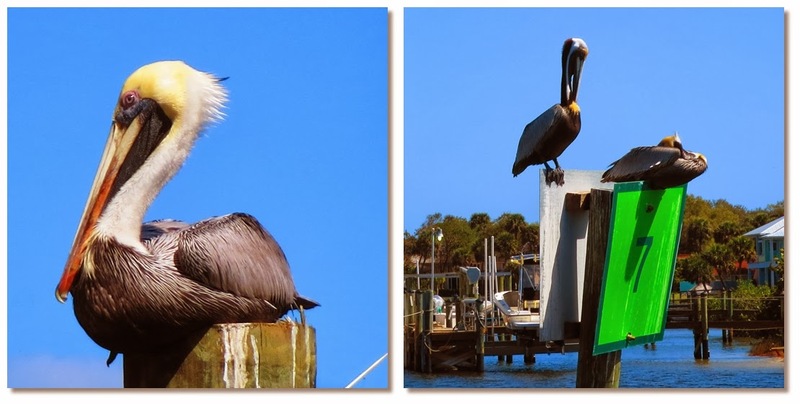 Yeah, we are still just around the corner in Martin county, Port Salerno, FL. I can tell you which epoxy of the local retailers is best... :) Send us a message on facebook, and we can link up. We'd love to check out your boat sometime.